Night fishing for trout has been good. Most anglers fishing under submersible lights are catching limits of chunky 2-pound rainbows. Nightcrawlers and Power Bait are working well. The trout will school in deeper/cooler water during the hot summer heat and move into shallow water at night to feed. It is a good idea to anchor in 40-60' of water that is near 100-200' areas. Drop your light 10-20' down and fish your presentations below that. The kokanee bite continues to get better each week. The weather is gradually getting warmer, which usually makes the fishing really good. The main lake has been holding schools of kokanee. Rose Island, the dam and the spillway have all been producing limits. 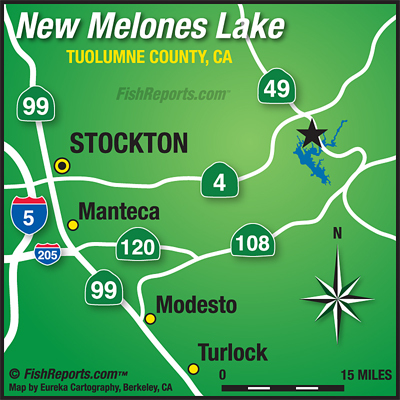 There are also fish being caught near the 49-bridge and Coyote Creek. Most of the fish are starting to look rather healthy measuring from 10-13" and we have had a couple reports of a few measuring 15-17". They have been biting an assortment of lures including Uncle Larry's Spinners, Glitter Bug's Micro Hoochies and Simon Wobblers ... Bass bite has slowed down and the majority of fish are heading back into deeper water. The spawn is complete and the fish are in a post-spawn stage. They will be feeding heavily in the morning and evenings and will be hanging in the deep water midday. Try using reaction type baits to catch the fish that are eager to feed. Then as the sun comes up switch to slower moving baits fished sub-surface. The fish are feeding on bluegill, shad, crawdads, and baby bass. Soft plastics and hard baits in these colors would all be good choices. In stained water try using brighter colors or baits that have more flash. Chartreuse and orange crankbaits and spinnerbaits will work well and a dye pen will enhance your soft plastics.